Check with your syllabus to find which tests you will need to know for the examination. Lithium - Crimson, Sodium - Yellow, Potassium - Lilac, Calcium - Red, Copper(II) - blue-green. 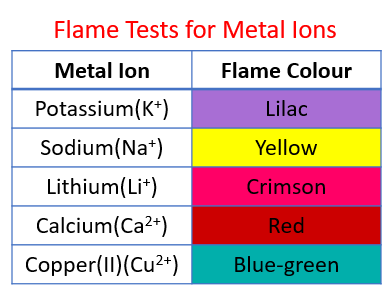 Use flame tests to identify metal ions (cations). Aluminium, ammonium, calcium, chromium(III), copper, iron(II), iron(III), Zinc. 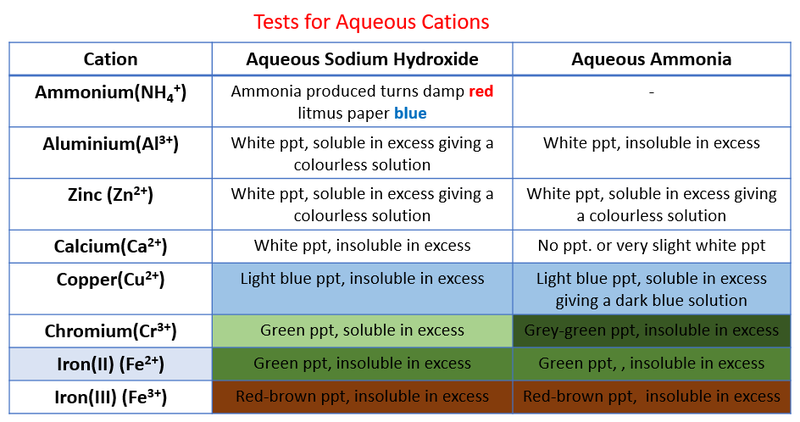 Sodium hydroxide is added slowly and then in excess to solutions of these salts. The zinc (II) and Aluminium (III) form white gelatinous hydroxide precipitates that redissolve. Copper (II) forms a light blue hydroxide that does not redisssolve. Iron (II) and (III), respectively, form green and brown hydroxides that do not redissolve.